Watermelon Cupcakes - Summer Time Party Dessert! Watermelon Cupcakes – Summer Time Party Dessert! Watermelon cupcakes! A recipe put together with the simplest ingredients. 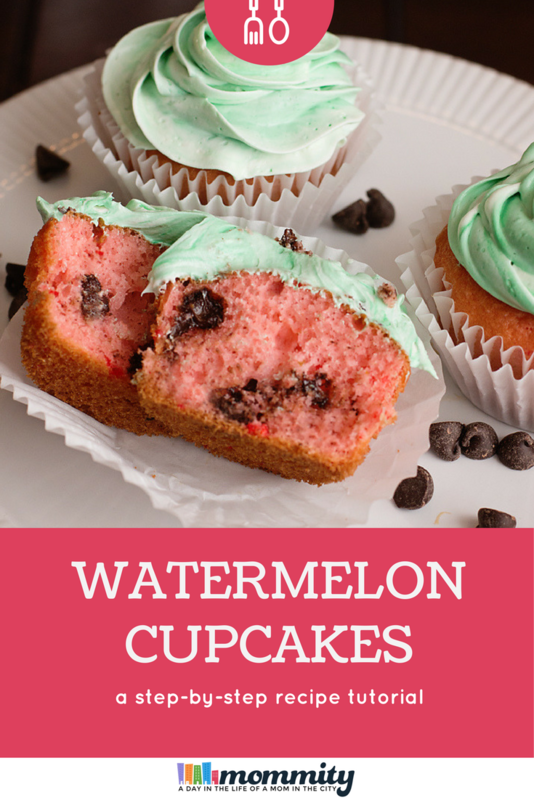 We took these watermelon cupcakes to a summer time potluck and everyone loved them. Can we queue the happy dance music and all rejoice that Summer is almost here?! Both kids are just about done with school and I could not be happier. It’s time for Summer BBQs, nights by the fire-pit roasting marshmallows, baking tons of delicious goodies and everything else that comes with Summer. It’s like a huge weight has been lifted and that horrible cold Winter is finally gone! We’ve already had a few BBQs at our house, gotta break in the new deck with our friends! My kids and I have been experimenting in the kitchen to find some fun new treats to serve to our guests. The kids picked watermelon cupcakes! But here’s the thing, the kids don’t like watermelon. This is why cupcakes that LOOKED like watermelon was their ideal BBQ food. Cake mix in a pink color – like strawberry or cherry. Unless you prefer the watermelon flavor! I saw the watermelon mix the last time we were at Walmart. 1/2 Cup – Semi-Sweet Chocolate Chips – We are nut-free in our house so we bake with Vermont Nut-Free Chocolate Semi-Sweet Chocolate Chips. Prepare the cake mix as directed on the box. We added 3 drops of red food coloring into the mix to make it a little more red (totally optional). Then mix in the chocolate chips and bake in the oven according to the box directions. I’m a simple girl so we went with a canned frosting that had a white color. Scoop the frosting into a bowl and add 3 drops of green food coloring. Swirl it around, carefully. Don’t over mix it! Scoop into a frosting bag and pipe your watermelon frostings. If you don’t over stir the food coloring, the frosting should leave a streaky effect.